I kissed my husband and gave him a gentle hug, and they rolled him into surgery. The doctor said, “He’s going to happy hour, and you’re going to the torture chamber.” Everyone laughed, but it wasn’t funny. It was true. For the next seven hours and fifteen minutes, I sat in the surgical waiting room. Watching. Listening. Thinking. Waiting. Before continuing, my husband is okay. He came through surgery like a champion. Cal had a brain tumor above his left eye. 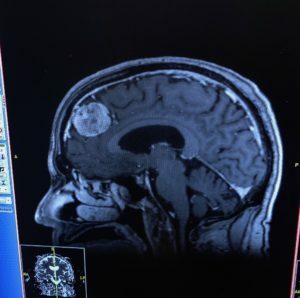 We had watched it for over three years on MRI’s, and the neurologist always thought it was not malignant but should come out while he was healthy. August 10th was the chosen date. The worry and fear of all the possible horrible outcomes engulfed me as I watched thirty plus couples walk into the surgical waiting room together. One would be called to go through the big swinging doors the other was left to wait for the good or bad news. EEEK! First sight after stocking cap came off. Some, like me, looked as though they were barely breathing, some, unlike me, had friends and family to laugh and visit with while the hours passed. I sat with my computer and wrote. Although unfocused, I was thankful for my overactive brain to be occupied. One by one, the people waiting would be called into a side room. Nobody had to share the doctor’s verdict; their faces told all. 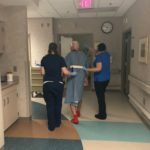 Walking within four hours of surgery. Five hours and fifteen minutes after I walked away from my husband and left him in the hands of strangers, they called me into the small room. The doctor said, “He truly is hard-headed!” He explained the tumor had calcified and had likely been there for years. They had to use a drill and chisel to get it out. Although challenging, the surgery was successful, and I could visit him in recovery within two hours. 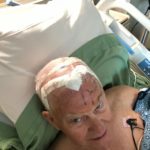 Seeing him in recovery was the first and last time he complained of a headache. He was released from the hospital the following day with Tylenol for pain. Other than his shaved head, he was and is doing awesome, and I am a recovering wreck. His surgery was not about me, at all, but it is an excellent example of how every story has two sides. I too have had major surgeries, and I choose happy hour over the torture chamber any day. I guess I like la la land better than reality. Very well written – so descriptive. Lois – thank your kind words….such a complement coming from someone who writes so well! Wow, so unexpected. So glad it went well. Too bad about the beautiful white hair but the least of the worries. Maybe he will like the bald look and keep it shaved. Can’t find the smile emojie so just imagine there is one. So wonderful he is doing well and recouping fast. I know the stress of knowing your loved one is suffering from something is really awful. Believe me, I know. Tell him to keep on getting better and letting his hair grow back! LOL. You both are in my thoughts. May Cal continue haveing a steady recovery. I relate to your torture chamber. It is scary, dark and long. Thoughts of you both. Arlene, I can tell you have been there – otherwise you wouldn’t know it is scary, dark and long…I lived 3-4 years that day:))) Thank you! Wish I could have been there for moral support while you were waiting, and waiting, and waiting. So glad the surgery was successful. Oh, Diana – I wish so too!!! I’m really a noodle – just have a good facade:))) I too am so GLAD it was successful! I also know you know! Our best wishes for a speedy recovery for Cal. Took my iPad over to share with Justin and Norma. Mary Ann called after Justin told her. The close neighbors are informed! I took over nectarine/blueberry salad this p.m. And Mary Ann and Lorraine took over dinner. Norma’s brain tumor is glioblastoma. Having radiation and chemo, now. Thanks for the picture and for sharing. Yes, I too have been on both sides and thanks for describing it so well!!! So glad he is doing well!